Utilizing our robust donation software, we enabled RedDoor Family Shelter to accept online donations in a customized fashion. RedDoor put in the original request to develop an addin 'Gift Giving' option to that very software. The 'Gift Giving' system has become a very popular attribute to their website and a source of many new donations. 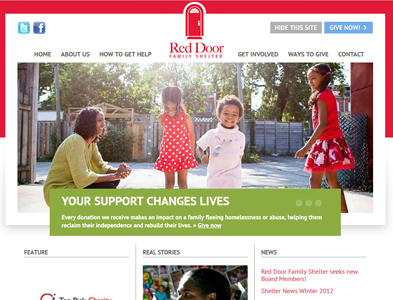 Intrigue has devised two generations of designs for the RedDoor website; both on a Drupal content management system. With Drupal, our team effectively trained the RedDoor staff to manage the graphics, news, events and content across the entire site. We are proud of how the site looks, delivers and raises money to yet another great cause.